Join leaders in stormwater and green infrastructure management at the inaugural Stormwater and Green Infrastructure Symposium. The Water Environment Federation (WEF; Alexandria, Va.) hosts this event to bring thought-leaders together, sharing information and deepening their technical knowledge in the field. The symposium offers an opening general session, 15 interactive sessions, 3 workshops, and other networking opportunities. Professionals involved with stormwater management and green infrastructure programs can participate in forums to share skills and knowledge, discuss issues in the sector, and develop new partnerships. 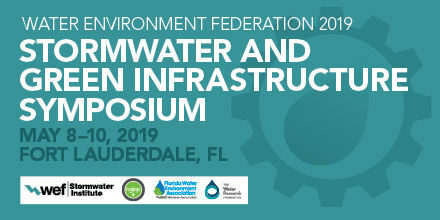 The symposium will be co-located in Fort Lauderdale, Fla., with the Residuals and Biosolids Conference 2019.